It’s a thin line, really, between oblivion and being on the fence. Neither allows you to adequately make a decision, and neither engages you enough in the consequences of a potential decision, should you make one. So here’s a great question: meringue or not meringue? While traditionally in France the tarte au citron is made with a lightly torched, sublimely delicate and shiny meringue, modern purists are leading a sort of revolution to overthrow the fluff of it all. 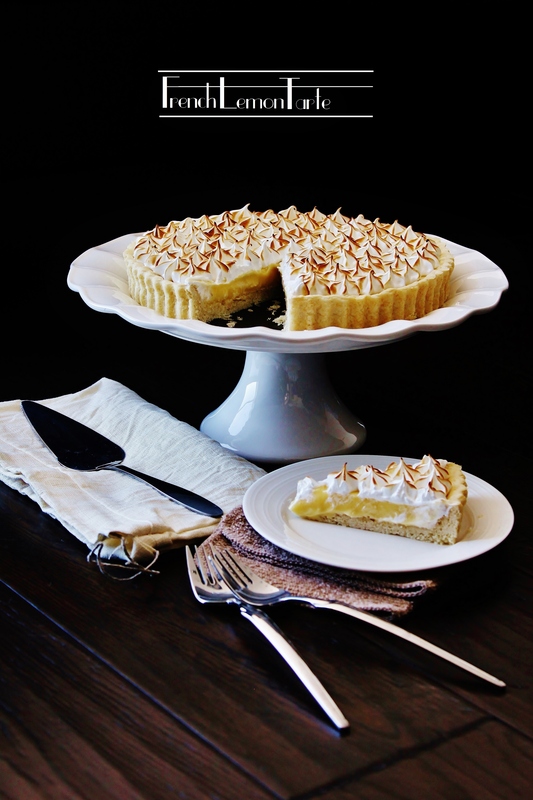 I made this tart about a week ago (and it was demolished right about then as well), and to be honest, I had no idea whether or not I wanted to pipe that meringue on. Even after finishing the pie I still had mixed feelings about it – not that its deliciousness was debatable, for it was by a modest margin at the top of my list of lemon-things-consumed – but somewhere in the back of my head was the question: what if I hadn’t put meringue on it? Today, walking to class, watching the snow melt. Boom. Brain parfumation happened. Like the snow, the meringue is not there to make everyone fall in love with it (you can tell I’ve had enough with this winter thing). Instead, it’s there to conceal what’s underneath, again, not because it’s anything to hide, but because it will add that much more ooh, aah, and sexiness to the lush underneath. That’s pretty romantic and french, and witty, I think. Oh, yeah, and how does that have to do with snow? Well, if you haven’t set foot on solid ground that is not compacted snow for 5 months, you’d understand the thrills of finally seeing the black pavement again. Sure, it’s just pavement, but that’s the beauty of snow – not itself, but it makes everything underneath more beautiful when it melts. To make the pate sablee, put the flour, baking powder, salt, and sugar in the the food processor and pulse until blended. Add the chunks of culd butter, and continue pulsing until the mixture becomes a very pale yellow and looks a bit grainy. While pulsing, stream in the cream until the mixture just begins to clump together. Cover a flat working surface with a film of plastic wrap, then dump the contents of the food processor onto the surface. Gather and press the mixture into a tight mound and flatten into an inch-thick round. Lift up the corners of the plastic wrap to wrap the dough snugly, then chill in the freezer for 20-30 minutes. Lightly flour your working surface. Unwrap your chilled dough and roll it out using a rolling pin to about 0.75cm thick, or with large enough area to cover a 9-inch fluted tart pan. Slide the removable bottom of the pan underneath the dough (be gentle as the dough is quite delicate), lift it up, then place it into the tart ring. Press the dough into the corner of the tart pan, and up the sides. Trim off any extra bits and use them to fill any areas that are not sufficiently covered. Chill in the freezer for another 20-30 minutes. Meanwhile, preheat the oven to 350 degrees F and feel free to do any cleanup to save time. Once the dough is finished chilling, dock it all over with a fork and bake, uncovered, for 18-20 minutes, or until pale golden. If the bottom’s puffed up, just pat it down gently with the back of a spoon while it’s still hot. Cool completely and chill until needed. To make the lemon cream, combine the sugar, lemon zest, lemon juice, and eggs in a saucepan. Cook on medium, whisking contents constantly, until the mixture begins to thicken. Stream in the cream, still whisking, until the mixture is well-tightened. Pass the lemon curd through a sieve placed over the butter, and stir until the butter is completely melted and the mixture is smooth. Pour into the baked tart shell and chill in the fridge overnight to set completely. To make the french meringue, place the egg whites and sugar in the bowl of a stand mixer (you can use your go-to mixing bowl if you have a hand-held) over a pot of barely simmering water. Beat with a whisk by hand until the sugar is fully dissolved, and the contents are quite warm to the touch. Attach the bowl to the stand mixer and whisk on medium-high for 8-10 minutes, or until the meringue is very glossy and quite firm (the tip should stand when you hold up the beater). Spoon the meringue into a star-tipped piping bag and pipe onto the chilled lemon tart. Torch it to make it pretty, then chill until ready to serve. This looks fantastic – great piping job. I need to practice my meringue so I can bust this out for spring ! Thanks! Yeah, lemon and spring do come hand in hand. Hope yours turns out beautifully! Thanks Anne, I’m just waiting for the rain to stop now for spring to get brighter! You are hilarious..”.brain parfumation?” I am truly enjoying your whole blog.Thank you…keep up the good work.Love the lemon tart, I will definitely try it, myself. Thanks Claudia! It’s so nice to get feedback, really appreciate it, let me know how the lemon tart treats you!